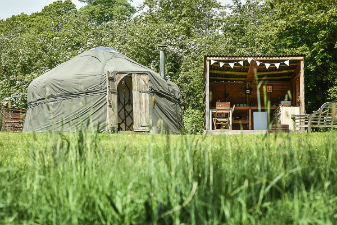 Welcome to Drybeck Farm in the heart of the beautiful and unspoilt Eden Valley, Cumbria near The Lake District. We offer a tailor made luxury outdoor holiday for families, couples and groups on the North East edge of the Lake District. 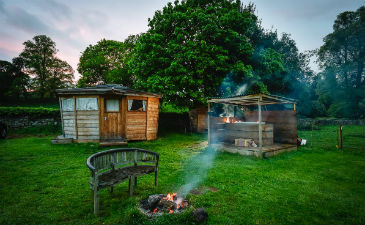 Our Glamping style accommodation consists of a traditional Mongolian Yurt, 2 gypsy caravans and 2 of our Quirky Wooden Cabins. All are lovingly renovated furnished and equipped with a real eye for detail. 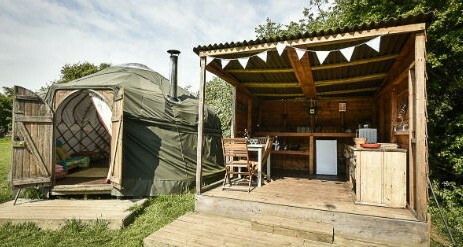 The accommodation is a back to nature experience without compromising on comfort. All accommodation is sited so that one is not overlooking the other, very private with lots of space for everybody. The setting is simply stunning – right on the banks of the river Eden in the midst of a typically pastoral English scene. In and around Drybeck, the key word is relaxing. Sitting by the river, taking a stroll through the woods, along the riverbank, or watching the local wildlife. The area is also ideal for on or off road cycling, and long country walks with many cosy village pubs for refreshments en-route. At Drybeck you will enjoy a world away from the pressures and stresses of workaday life. All you have to do is turn up, switch off and allow yourselves to slip into an altogether different pace. Our magical yurt nestles unobtrusively on the river bank. 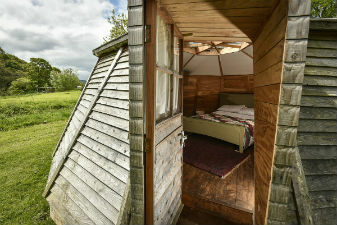 It is handcrafted by the Lakeland Yurt Company from locally grown timber into the perfect rural retreat for couples, families or a small group of friends. Step through the doors into a stunning beautifully appointed interior with vintage furniture and soft furnishings either re-cycled or personally chosen by Paula. 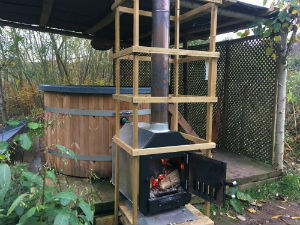 The wood burning stove will soon chase away the evening chill for you to then wake up to the sound of the birds and the river. On fine evenings you can sit outside by a roaring fire whilst listening to the owls and the splash of fish jumping in the river. 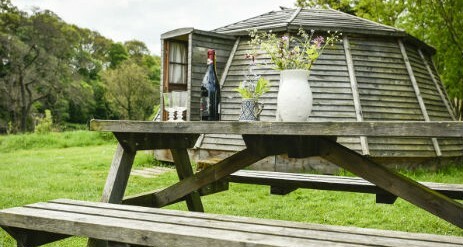 Our beautiful gypsy caravans are each in their own idyllic private locations on the banks of the river Eden. The slightly larger one, Evelyn, is in the style of a traditional Reading Wagon whilst Ruby is a Bow Top Caravan tucked away in a most idyllic corner by the river. This is nothing like roughing it; soft, warm quilts and bedding in cosy interiors lit with candle lanterns help make a perfect romantic retreat for two. On chilly evenings their wood burning stoves will keep you warm and snug. If you are really lucky you may get a glimpse of an elusive otter. Each caravan has it’s own cookhouse with running water and electricity with electric hob and oven and fridge. Each kitchen is fully equipped with crockery and utensil. Alternatively you can cook your breakfast of Drybeck farm sausage bacon and eggs over an open fire …mmmmm. This is Drybeck’s unique take on the ubiquitous Camping pods that have become very popular elsewhere. We have taken this basic idea and created our own characterful version. The Wigloo is the first of our takes on the Camping Pod concept. 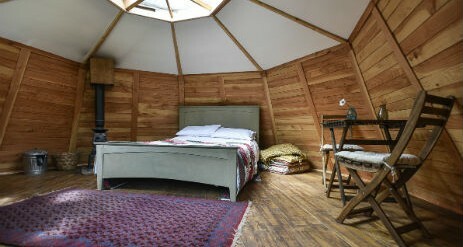 Looking like a wooden igloo we have christened it the ‘Wigloo’. 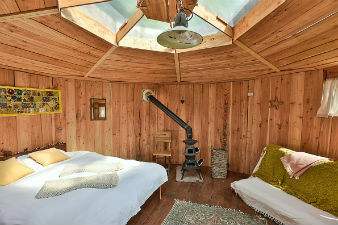 It has a circular skylight in the middle of the roof like a yurt. 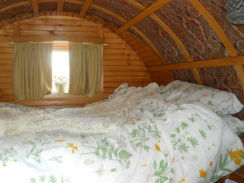 It sleeps 4 and has a fully equipped cookhouses to the side of it for your own sole use leaving plenty more room inside. 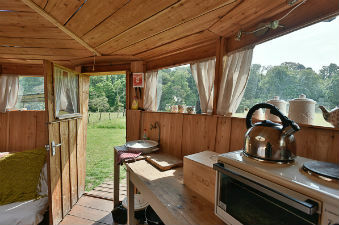 The cookhouse has a hob & oven, fridge, running water and a full range of utensils. The Lantern House is the second of our takes on the Camping Pod concept. 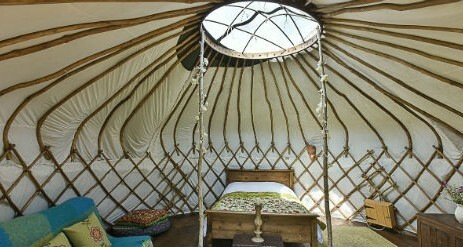 This is larger than the Wigloo, sleeping up to 4 and looks a bit like, we think, a traditional lantern, hence the name. 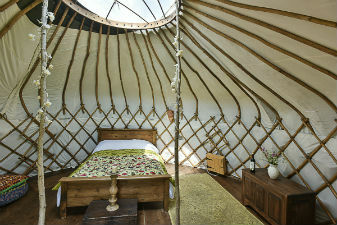 It is very light and airy contains a double bed, wood burning stove, double futon and fully equipped kitchen area. It is ideal for either a couple or family. 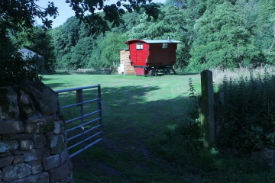 It is especially suited to those wanting more privacy as it is quite a distance from Drybeck’s other accommodation. 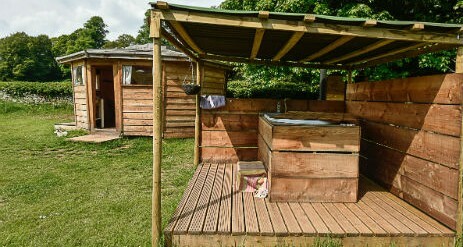 We have an outdoor hot tub in a magical setting looking out over the River Eden. It has screening around it and a canopy over the top which means that you can enjoy the outdoor experience in private whilst being offered protection from the weather if it is less than perfect. 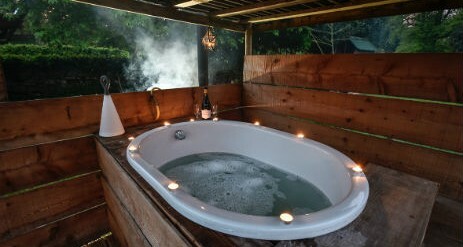 You can soak in the tub and look out over the river whilst enjoying a glass of your favourite tipple. 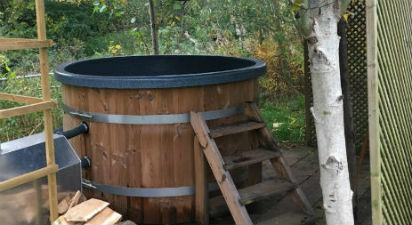 It is available to hire on a first come first served basis. It is available right through the day and until late in the evening. 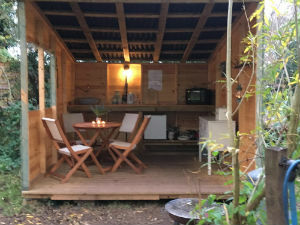 Each of our accommodation units has its own private cookhouse immediately to the side of it. These are open fronted structures which are sited to be sheltered form the prevailing weather. They are all provided with electricity and running water and contain an electric oven / grill / hob, fridge, table and chairs and a full inventory of crockery and kitchen utensils. All you need to bring in this department is your food. This is an outdoor experience with indoor amenities. If you wish to be a little more adventurous every accommodation unit has a fire pit on which you can also cook. For environmental reasons we decided to install compost loos. 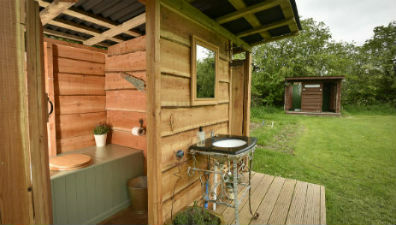 These have been described by some of our guests as “the quaintest and cutest loos they have ever used.” We manage and maintain them very closely to ensure they are pleasant to use. We have electric showers which provide plenty of hot water. You will also find eco friendly shower gel, shampoo and conditioner provided by ourselves. Walks – down river to Wetheral or upstream to Armathwaite and the rock carvings and Coombe Woods or around High Stand Plantation (maps and directions can be provided). Just a 5 minute walk across the field from Drybeck is the beautiful country house of Low House. As well as being a venue for weddings and other social and corporate events they will provide lunches, afternoon teas and dinners for groups of 6 or more. Ideal for groups who have come to stay at Drybeck for a special celebration. Using Drybeck Farm as your base – From The Lake District to The Borders discover The Eden Valley and Carlisle. Easily reached by car is the Lake District with its beautiful lakes, valleys, dramatic high fells and the borderlands including Hadrian’s Wall. MID-WEEK SPECIAL OFFERS ON ALL ACCOMMODATION- MON – WED or WED – FRI OUTSIDE OF SCHOOL HOLIDAYS FROM £79.